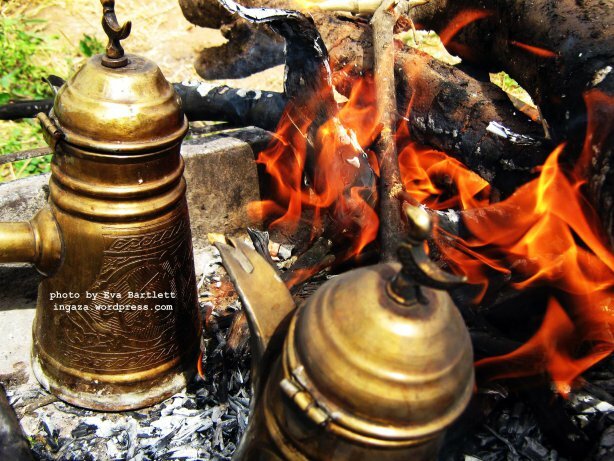 Photo of coffee in Gaza from http://ingaza.wordpress.com/. War changes the taste of coffee. Sweets are no longer as they were before, and no one wants to touch them once the kids have gone. A bitter taste settles into our eyes and into our hearts. Today is the thirteenth day of the war — of the sudden death. Every day we greet, leave, and call each other, attempting to support each other, but time gets us! We all feel those terrible shells that are so close to our heads. I hear about a young man from Rafah, and I cannot believe that only his lower half has reached the hospital. The artillery shell divided him, while still inside his house, into two halves. The lower half reached the hospital the next day, but the upper one is still lost. The head, the chest, the back, and the hands have not yet left his home. A day is gone and the body hasn’t been joined together to be carried in the white shroud, to get a final farewell from his friends, or even just to be buried. What damned coffee am I talking about? Is this about the distress that settles in us, like a lamb in our throat instead of tears? Oh, God, how miserable is the one who doesn’t shed tears because he conceals his rage, sadness, subjugation, fear, death, and becomes a tormented being. Does anyone know the meaning of our torment? This adventure of living in Gaza is an intermittent one. But, with all of us, it has recurred at least thrice. Our children grow, but those who’ve reached ten years of age have witnessed the Israeli attacks destroying everything three times in their still-short lives. How dare we tell them about childhood memories? Indeed, how will they describe their childhood to their future children? They will tell of this adventure: of living under shelling without electricity, water, safety, sleep, or even one’s own body. You think you are still alive, but in fact you are tricking life and waiting in a long queue, unaware of where death might come from. Life here is like the unconscious. You think you are still alive, but in fact you are tricking life and waiting in a long queue, unaware of where death might come from. Shall it unexpectedly come from the heavens? The sea? The land? Your belief in God is your only equilibrium, the only thing that returns your consciousness to you, so that you feel you are you, that this is your house, and that this is your stolen home. Death in our eyes means anxiety, expectation, and waiting. It is seeing martyrs when they turn into dismembered limbs such that you cannot remember their beautiful faces. It is when your memory stops at a scattered image to disperse your soul and send you back the seventh land. Your sea of anger may extend, your concealed volcano might explode, and then you scream blue murder out of this tragedy! Death bluffs you, but then he makes you wait on his schedule. It is the mother’s tragedy: Death is seeing off your loved ones at every moment, every hour. Sometimes, you want so badly to keep silent and to keep gazing all the time at the faces of those you love, because you do not know who will leave next. Is it you? Will they? Or will you all go together? In Gaza, death doesn’t come all at once, but it can take an entire family in one stoke. The paradox of life and death must have been created in Gaza. Death bluffs you, but then he makes you wait on his schedule. If you ignore Death and have fun, then you arouse his anger. He will keep hovering around you until you surrender to him, when he will leave you to rave and recite prayers. Death leaves you, but his image controls your imagination. Everything around reminds you of Death: planes, missiles, battleships, tanks, bombs, and explosions. And you — you have nothing but your body, your hardness, and your belief. An entire army bombs Gaza with great strength, as if Gaza were a piece of cake in front of them. An entire army directs its spines at Gaza: at her hair, at her chest, and even at her face. An entire army, fully equipped, fights a Palestinian child in Gaza, whose ancestors lost their land, their country, and their memories. An entire army wants to remove the offspring of those who were killed, and whose land was occupied. It wants to plunder what remains. An entire army bombs Gaza with great strength, as if Gaza were a piece of cake in front of them. As if its inhabitants were nothing, creatures with no feelings. As if they didn’t feel, get hurt, cry, get tired, and as though they don’t have tears! As though their only similarity with human beings is that they are full of blood. The army trampled, with all of its strength, over the children’s bodies and the fetuses in their mothers’ wombs. As if we in Gaza are not humans. Ladies and gentlemen, we are humans exactly like you. We feel, get hurt, cry, and lose our souls, families, and houses. We are paying the price of your actions in Gaza. Gaza suffers from this threat on its life. Gaza suffers the destruction of entire families. Yes, watch and bet on who can kill more! Gaza is not a number, but some eyes need to be shocked: al-Batsh family lost eighteen members, al-Hajj family lost eight, the Abo Garad family lost eight, the Kawaria family lost eight, and al-Ghanam family lost five. Most of these were women, children, and even fetuses. In Gaza, there is torment, and there is a slaughter of Palestinian human beings. Is another night of war enough to feel us? Hedaya Shamun is a Palestinian writer and reporter. Translator Shaimaa Debees is a student of English in faculty of languages at al-Alsun. Powerful testimony from Gazan author Hedaya Shamun. When will it end? And I came here via Safia’s blog. I admire how you’ve written so beautifully about such a dreadful situation by linking the horror with the everyday. I hope this will bring in more readers, it’s the very least we can do to be informed and not turn away. It hurts my heart when I think about how the people of Palestine have suffered and will continue to suffer because the powers that be will let them.